It’s the outdoor adventure of a lifetime – dog sledding tours of the Canadian Rockies! Nothing can prepare you for the experience: the excitement of riding in the sled as it traverses the snowy trail; the quiet, regal beauty of the Canadian Rockies all around you, the warmth and respect you will feel after meeting and watching the sled dog team work – there’s nothing else quite like it. Offering 4 different dog sledding tours (including one by moonlight!) Cold Fire Creek Dogsledding gives you the opportunity to find out for yourself just how exhilarating and unique an experience dog sledding can be. The four tours range between an hour and a half in length to four and a half hours, with the shorter tour being more suitable for those just looking for a taste of the experience and the longer ones for those who would prefer a more immersive experience. All four tours include rejuvenating food and drink of some kind to warm you back up and replenish those lost nutrients after your sledding experience. 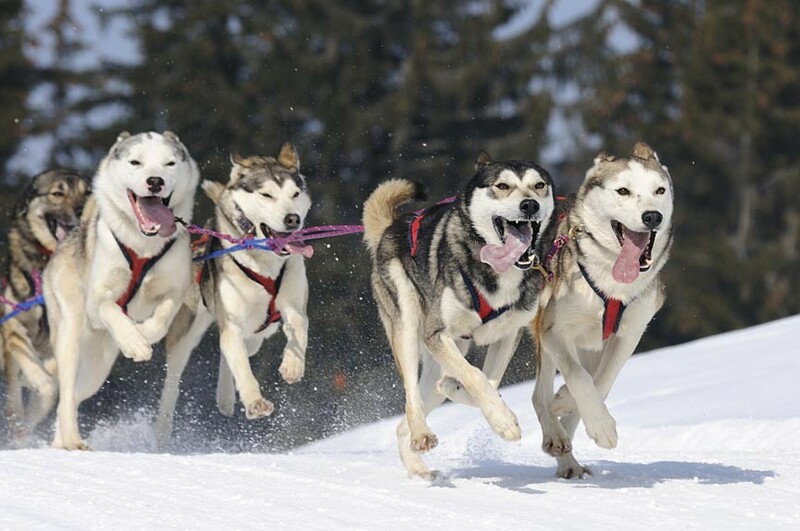 Cold Fire Creek’s dog sledding tours use Alaskan Husky or mixed breed Northern Dogs to pull their sleds. At any given time they have around 75 of these good humoured, hard working dogs in their kennels. Trained from pups to pull sleds, these dogs like people and love their job, so there’s no need to be nervous around them or worried about their well-being. Want to learn to drive the sled? The average adult is big and strong enough, so sure! Prefer to ride? No problem! Want to help with the dogs? Some of the tours accommodate the would-be helpful individual – so yes! Want to pet the dogs? Go for it – but be warned you can’t pet just one! When your tour is over, come on back to your cabin or room at the main lodge here at Mount Robson Mountain River Lodge. We’ll be keeping the room warm for you.